From oatmeal everywhere (except the bowl) to messy spaghetti dinners, the easiest thing about mealtime is using the award-winning Nomi Highchair. Created by renowned designer Peter Opsvik (he created the beloved Stokke Tripp Trapp for his son, the Nomi is his creation for his grandkids) this ergonomically designed seat grows with your little one from the newborn months all the way to their teenage years. . . although your spoon-turned-airplane trick won’t be as amusing. Parents love the sleek, modern style, gorgeous colors, and how easy it is to assemble and adjust (no tools required!). The wooden “stem” works with several add-ons and configurations to grow with your little one. Start with the Nomi Baby, a comfy, supportive recliner for newborns, or use the Nomi Mini to create the ultimate highchair for your ready-to-be-at-the-table-tot. The Mini is a sort of belly restraint and harness that clips right onto the seat and can be used with or without a tray. The Nomi is safe and comfortable, thanks to the soft, rounded edges, and the entire thing can be easily wiped down (0r hosed off! )—no washing machine needed! It’s super lightweight, so you can easily move it around as needed and it’s made with recyclable materials free from parabens and phthalates. 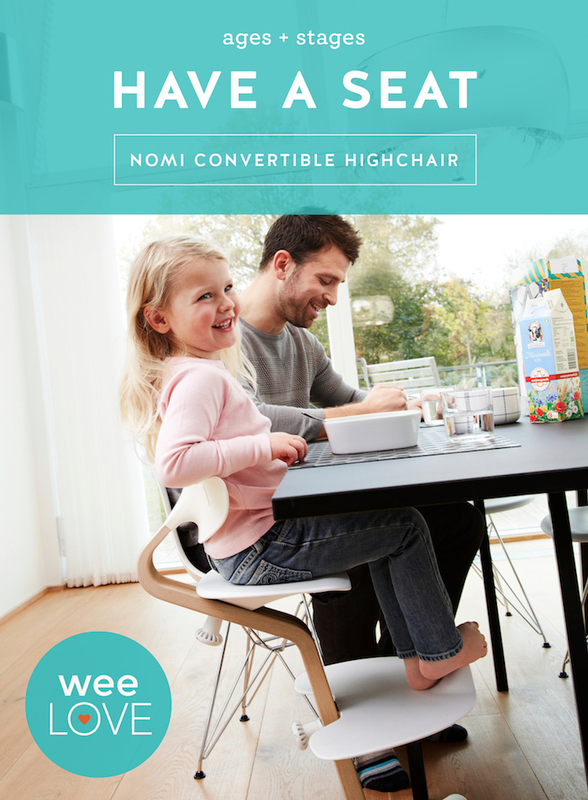 Plus, the Nomi features anti-tilt rear wheels, so the chair moves with your kiddo instead of tipping backwards—which is especially important when kids use their superhuman strength to push away from the table at the sight of green veggies. Once your child is two, remove the Mini and just use it as a seat at the table. To get even more bang for your buck (because it’s on the pricey side—it’s an investment piece that’ll last through multiple kids), the Nomi is an awesome desk chair for older kids (or even adults—members of our team use them on the regular!). This chair delivers top-notch safety and comfort features. And it’ll even make a kitchen covered in marinara sauce look good. Next story weeLove: Diaper blowouts away from home? Handled.